Many business leaders view marketing as the crass, ugly side of business. This new book proves that "marketing" isn't a dirty word -- it's the key to advancing both business ideals and the bottom line. Written by two down-to-earth, experienced entrepreneurs, Marketing That Matters is an in-the-trenches guide to building a marketing plan that embodies personal values instead of exploiting them. This compact volume provides overworked entrepreneurs, who want to match their mission with their values but who lack the time or training to develop a strategy, with the steps needed to incorporate effective marketing into their business plan. 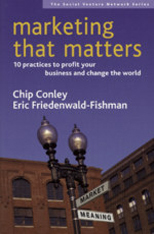 Full of inspiring stories from successful companies, Marketing That Matters offers ten key principles that help guide any business, including goal setting, communication basics, and the importance of establishing an emotional connection. Throughout, the focus remains on combining value with values.